An expert review of Bosch Aquastar 2700ES. Explore the highest efficient and Energy Star approved Bosch Aquastar hot water heaters with the best features and specs. Bosch Aquastar 2700ES is the highest energy-efficient and Energy Star approved model from this company. With the maximum gas input of 199,000 Btus/hr this is the most powerful model that also provides the highest water flow rate of 7.2 gallons per minute. This is why Aquastar 2700ES is recommended for homes with two to three bathrooms or for supplying 2-3 major applications simultaneously. Bosch Aquastar 2700ES is the wall-mounted unit that saves the valuable space in your home as it measures only 30 x 18 x 11 inches. Built as the direct vent room sealed combustion model it runs safe and reliable when installed indoor, while the power-vent option allows horizontal and vertical vent termination, making this unit truly flexible, with numerous venting possibilities. Aquastar 2700ES is designed for indoor installation mainly, but if you order the vent kit AQOK you are gaining more flexibility as the kit allows you the outdoor installation. 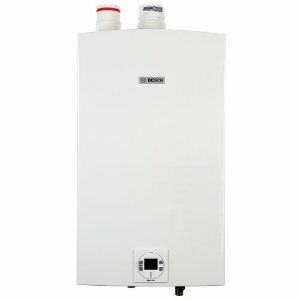 As long as the electricity, gas and water are supplied, Aquastar tankless hot water heaters are providing an endless and continuous hot water supply and thanks to the modulating gas valve with constant gas-air ration control brings less fluctuation in water temperature and more comfort. High power pre-mix Ceramat gas burner combined with the two fans provides the high efficient gas combustion with low NOx emission. This is what makes them green, and with the high efficient heat exchanger are what brings the costs down as this unit is eligible for government credits and other utility rebates. Just by using tankless technology you will save approximately 50% on utility costs, as stated by Bosch. As other modern tankless water heaters, Aquastar 2700ES is not using pilot light but electronic ignition which activates when the minimum flow rate of 0.65 gallons per minute is met. Aquastar 2700ES is equipped with the troubleshooting system which provides real-time information and gives you the failure codes for easy diagnostics and fix. The information are shown on the LCD display found at the front of the unit where the key pad buttons allow easy manipulation. There is also a remote control TSTA2 as the optional accessory which allows wireless control and monitoring. Bosch Aquastar 2700ES is not designed for manufactured or mobile homes and home space heating. Gas and water connection: 3/4"
Combustion air pipe: 3" PVC, aluminum or galvanized.